USB packaging is good for more than just protecting flash drives! It can also be used to advertise a brand, company or organization thanks to custom printed packaging from your USB supplier. The most common packages include boxes, tins, pouches and custom plastic cases. Due to the innovation and creative flexibility of custom flash drives, USB packaging may evolve with the technology and take on other unique shapes. Some packaging is built to hold room for additional media and presentation supplements like booklets, inserts and discs. Flash drive packages are versatile for a variety of retail environments, personal uses and presentation settings. Plastic cases may take shape into book-like or clamshell designs. The former option for plastic cases can closely resemble a DVD or Blu-ray Amaray case. These types of cases are known as Flash Pac cases, and their design is specifically geared toward USB flash drives. One Flash Pac case will hold one to three USB flash drives at a time. Some single drive cases may also feature an additional tray to hold a CD, DVD or Blu-ray. The Flash Pac offers stable and secure portability when the USB drives are locked securely into place. The drives are anchored by a plastic molded cutout that fits snugly around the cap and drive. Clips built on the inside of the case hold standard sized promotional booklets and inserts to enhance the marketing and presentation of the flash drive product. The outside of the case employs a vinyl sleeve to hold additional promotional entrapments. These features combined provide a uniform, retail appearance of the Flash Pac. Vinyl sleeves for entrapment covers may also be employed to take advantage of printing area on the outside of the case. Sleeves are ideal for promotions and presentations because of their ability to display information on the disc material while maintaining a slim and compact size. Tins can be cushioned with foam or another material to showcase the flash drive upon opening. A plastic window can be built into the tin to enhance the visual appeal of both the drive and the tin case. Due to the metal nature of the tin, silkscreen and laser etching techniques are the most common ways to add designs or logos. 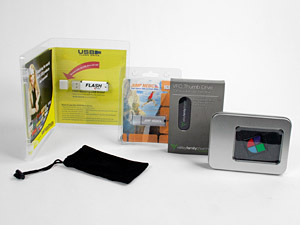 USB box packages can be created from plastic or sturdy cardboard or paper stock. These flash drive boxes resemble what can be found in stores and are therefore likely to render the most retail ready look, especially if the box uses a hanging tab ready for display. There is ample surface available for printing labels, product descriptions and barcodes. Other USB drive box cases may look more personalized, similar to a jewelry box in their shape and feel; many are supplied with a velvety cushioned pad to improve the visual and quality factors. These are ideal for corporate events or a bonus with purchase, as they make the USB drives feel more like a special gift. Pouches are another category of flash drive packaging that lacks the rigid structure of other cases. The benefits of pouches are that their soft nature allows them to fit anywhere while still preventing scratches to the USB drives. Pouch contents are secured with the use of a drawstring. The velvety cloth can endure custom printing like its plastic and metal counterparts. Single color silkscreen printing is a USB pouch's most viable option.